The New Ford Kuga is not only powerful and more stylish than before, but is also our smartest SUV yet. Redesigned with a bolder look and advanced technologies, the New Kuga offers the new Ford SYNC 3 technology with voice control and 8” touchscreen, both Park Assist and Out-Park Assist, Intelligent All-Wheel Drive system, and much more. This robust and sporty off-road vehicle catches the eye whether it’s on the road or testing different terrains. The redesigned front grille, wider bonnet dome, and restyled interior captures the vehicles new distinctive style. Created with open space in mind, the Kuga’s interior has been redesigned with accessible technologies such as the Ford SYNC 3 with Voice Control and 8” touchscreen that’s faster and easier to use, beautifully detailed instruments and switches, and extra sound-proofing materials. A glass panoramic roof offers plenty of sun shine and fresh air, thanks to the electrically-operated opening sliding action. 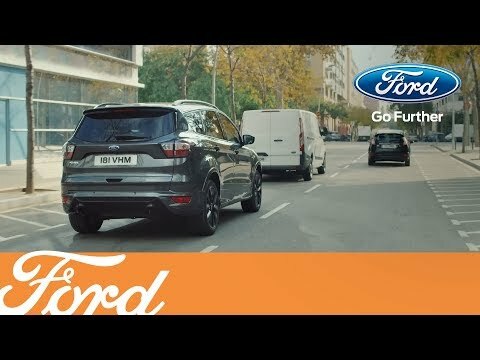 The New Ford Kuga has optimised its external space as well adding to its body an electrically releasable tow bar that tucks safely away behind the rear bumper when not in use and Adaptive Lighting with Dynamic Curve Lighting that turns when the wheel does to help you see further. Ford’s Intelligent All-Wheel Drive system works to enhance the New Kuga’s driving experience by continually monitoring your driving environment, optimising traction whatever the surface, to direct power to the wheels that need it most, giving you peace of mind. Intelligent All-Wheel Drive: designed to continually monitor where power is needed and automatically applies the required torque to each individual wheel for maximum traction, whatever the surface.